The Multi Quick 3 hand blender gives you controllable and powerful blending with PowerBell technology that is proven to produce finer and more even results. 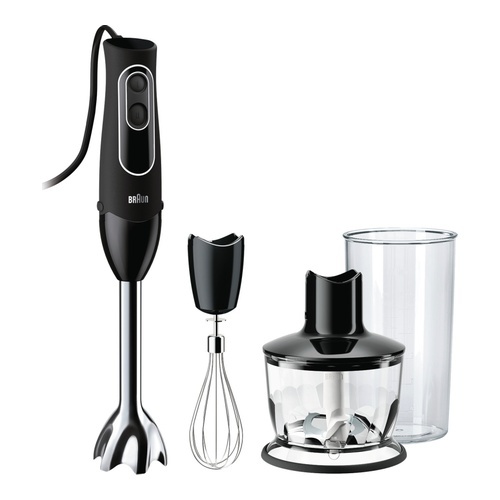 The hand blender has 2 speed control for single handed use, and the SPLASHcontrol encures a spotless kitchen. The handblender is extra lightweight and has a ergonomic, slim and soft grip handle for maximum comfort and convenience while blending. The patented EasyClick design ensures that all attachments can be removed in one simple click which also makes it easy to clean. The hand blener comes with a 600 ml BPA-free plastic beaker with ml and fl oz measurements, a 500 ml chopper that chops meat, hard cheese, nuts herbs and carrots in seconds and a whisk that easily whips, beats and stirs eggs, cream and fluffy desserts. 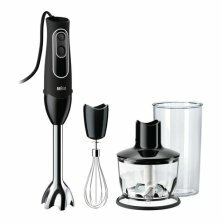 The Multi Quick 3 hand blender gives you controllable and powerful blending with PowerBell technology, SPLASHcontrol and 2 speed control. It comes with a 600 ml BPA-free plastic beaker, a 500 ml and a whisk.